LEXUS has finally added diesel power to its flagship four-wheel drive. It's been 20 years in the making and many will wonder why it didn't happen on day one. 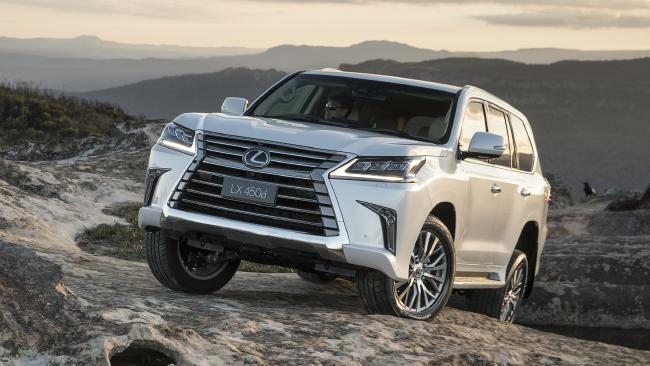 The Lexus LX previously came solely with a petrol V8 - and the hefty fuel bill you might expect from a 2.7-tonne 4WD. Transplanting the diesel from the Toyota LandCruiser on which the Lexus is based might seem an obvious move but the majority of LX sales are in the US and the Middle East, where petrol is preferred. Australian LX sales are minuscule by global standards but somehow Lexus made the financials add up and we now have the LX450d. It arrives late in the model cycle of this generation LX, introduced in 2008 and facelifted twice already. The only visual difference between the petrol and diesel versions is the badge. Power comes from the 'Cruiser's 4.5-litre V8 twin-turbo diesel, with the same outputs, 200kW/650Nm. 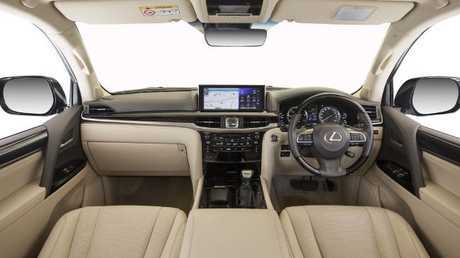 It retains the six-speed auto from the LandCruiser rather than using the eight-speed from the petrol V8 LX570. Towing capacity is still 3500kg. As the diesel engine is heavier, Lexus engineers removed some of the luxury items so the rolling mass remains about the same. Missing - for now - are sunroof, Mark Levinson audio, DVD screens on the headrests, and the third row of seats, making it a five-seater rather than eight-seater. Thankfully it retains the chilled centre console. The diesel gets a sole 93L fuel tank - the petrol version has a 45L sub tank to boost capacity to 138L - but can get further between refills. The range is almost 1000km in ideal conditions because it uses a third less fuel, 9.5L/100km of diesel against 14.4L of petrol. The other sweetener: the LX450d is $8600 cheaper than the LX570, although it's $22,000 dearer than the LandCruiser range-topper. 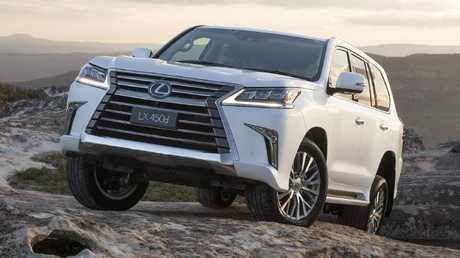 The LX450d's list price is $134,500 plus on-road costs, taking it to $146,600. The Lexus is covered by a four-year/ 100,000km warranty versus three years/ 100,000km for Toyota. 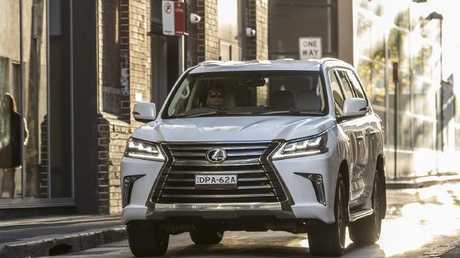 Servicing costs on the LX450d are out of this world ($3112 over three years) versus $1320 for the LandCruiser's capped price - and subsidised - service program, with the same six-month/10,000km intervals. Lexus has made its lifework about suppressing noise but the sound of a V8 diesel coming to life after pressing the LX's start button is heavenly. The prayers of Lexus 4WD buyers have been answered. It's more muted than the LandCruiser thanks to extra sound-deadening but there's no mistaking that this is the real deal. With a torque graph that looks like a tabletop, power delivery is both seamless and effortless. It feels unstoppable. Inside the cabin, creature comforts abound. There's a 12-inch screen in the centre of the dash for infotainment, a digital speed display in the instrument cluster and a head-up display in the lower section of the windscreen. The cabin controller that operates the audio and navigation is still a fiddly contraption that appears to have been modelled on a computer mouse. It might work well in a test lab but it's difficult and distracting to operate in a moving car. Adding to the frustration, addresses can't be added to the navigation when the car is in motion. Even the passenger can't input a destination. Another small annoyance: the 360-degree camera view disappears as soon as you select Drive. Other brands leave the display up a little longer, handy when inching out of tight spots and switching between forward and reverse in quick succession. The infotainment experience is at odds with the rest of the car, which is a serenely comfortable environment. There is a commanding view of the road from the driver's seat and it has ample adjustment. The steering wheel gets paddle-shifters to select gears manually, if desired. And the cargo area has acres of space, aided by a second-row seat that also slides and/or tilts forward. A dial in the centre console adjusts suspension between comfort, normal and sport modes. Riding on 20-inch wheels with relatively low-profile tyres, it's best left in comfort or normal. As it stands, the ride is busier and more floaty than other luxury 4WDs, in part because this is a serious off-roader with heavy-duty underpinnings. It's the trade-off for genuine go-anywhere ability but if you really want to get comfortable - or further off the beaten track - consider fitting a set of smaller LandCruiser wheels with more sidewall cushioning. The LX450d has been a long time coming but it's worth the wait. PRICE The first diesel LX in 20 years starts from $146,000 drive-away, about $8600 less than the better-equipped petrol V8 and $22,000 dearer than a top-of-the-range Toyota LandCruiser Sahara diesel. TECH Auto-blanking high-beam, radar cruise control, blind zone warning and lane wander alert (though not lane keeping) are standard. Apple CarPlay/Android Auto still not available on Lexus models locally. 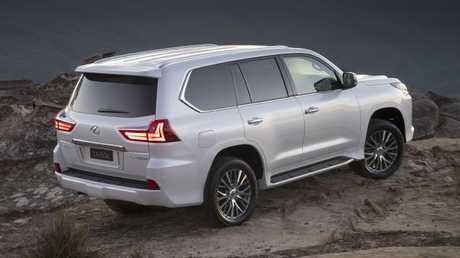 DRIVING The 4.5-litre twin turbo diesel V8 (200kW/650Nm) and six-speed auto are as used in the LandCruiser. 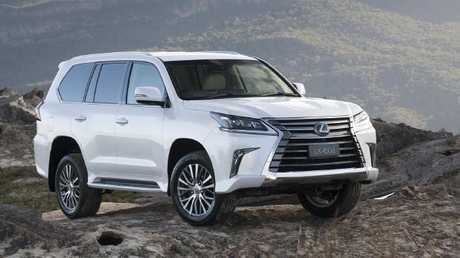 The LX570 with a 5.7-litre V8 petrol (270kW/530Nm) backed by eight-speed auto is still available. Steering and suspension tunes for each model are unique. PERFORMANCE Acceleration of both variants is on par, with the petrol V8 having the edge over the diesel V8 mainly due to the extra transmission ratios. The diesel uses one-third less fuel than the petrol. DESIGN The Lexus has a unique body and interior, though it shares much of the LandCruiser's underpinnings. 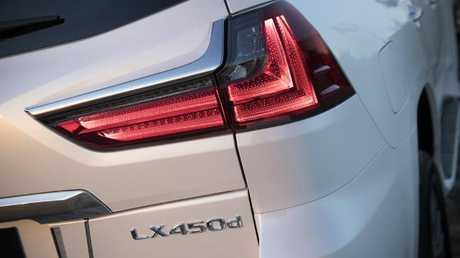 The only way to pick the difference between LX engine variants is the badge on the tailgate.